I'm back again to share a quick and simple thank you card featuring some pretty flowers I made with ribbon. These flowers are really fun to make and can be adapted to different styles so easily by changing the ribbon and centres. 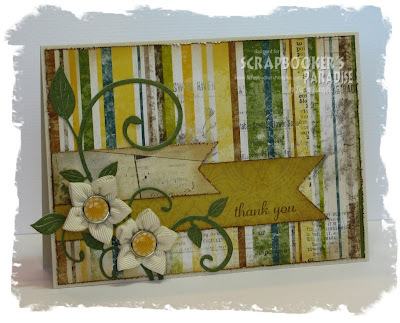 I have put together a step by step photo tutorial for creating these flowers over on the Scrapbooker's Paradise blog. For more details on my card and to check out the tutorial, go here. I hope you like them and give them a try! Thanks so much for visiting and for taking the time to leave a comment. I love reading them and having the chance to visit you too. I have been away, so I have fallen behind again, but will start catching up with everyone again tomorrow (after I get some much needed zzzzzzz's!). These look gorgeous Dawm , off to check out your tutorial now..
Wow Love this card and I have to give a go at these ribbon flowers!! !